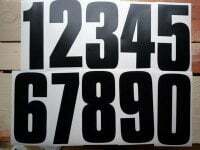 A pair of personalised Number Plate stickers. Designed to cover ugly Dealer advertising on number plates. All you need to do is tell us what text you want on them. You may have as many letters as you like, but only in a single line, and be aware that the more letters the smaller the size. Font is Aurora as this allows the most comfortable fit in the space available. Text must be the same on both stickers. Each sticker measures approximately 140mm x 18mm, and two are supplied. One in white for the front plate and one in yellow or the rear plate. 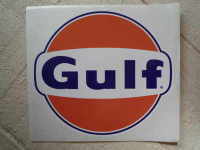 Stickers are cut to oblong shape, the white square that you see is backing paper. 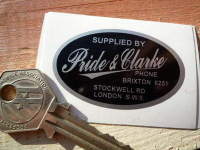 Pride & Clarke London Motorcycle Dealers Sticker. 2". 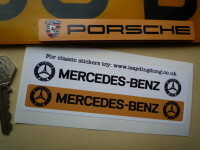 Mercedes Benz Number Plate Dealer Logo Cover Stickers. 5.5" Pair. 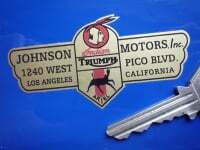 Coombs of Guildford Daimler Jaguar Rover Triumph Distributors Sticker. 9". 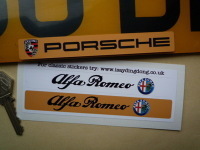 Alfa Romeo Number Plate Dealer Logo Cover Stickers. 5.5" Pair. 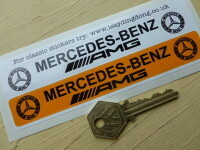 Mercedes Benz AMG Number Plate Dealer Logo Cover Stickers. 5.5" Pair. 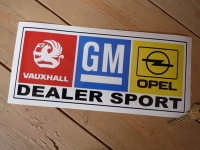 Vauxhall Dealer Sport Oblong Stickers. 8.5" or 10.5" Pair.